A longtime sustainability scholar at Southern Illinois University Edwardsville has won the Research Award of Excellence from Green Roofs for Healthy Cities, a not-for-profit association working to promote the industry throughout North America. Bill Retzlaff, PhD, and College of Arts and Sciences associate dean and research co-director of the St. Louis metropolitan area research collaboration (G.R.E.E.N. – Green Roof Environmental Evaluation Network) based at SIUE, is one of the 2015 Awards of Excellence winners. “I think it’s a great honor for SIUE. I’m humbled to receive the award,” said Retzlaff, whose main areas of research include evaluation of green roof and green wall technologies, sustainable green infrastructure and sustainable use of residual waste products. The benefits of green roofs depend upon the region in which they are installed, Retzlaff illuminated. “In St. Louis, there is a significant problem with storm water run-off because of the rainfall. Green roofs can mitigate the effects of run-off, because the rain fall is retained on the roof and the plants utilize it. Retzlaff served as chair for the Green Roofs for Healthy Cities Research Committee from 2010-2013 and held the position of vice chair from 2008-2010. 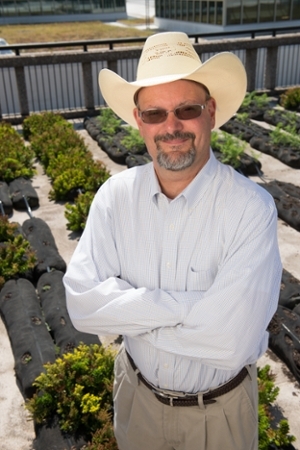 He will serve as moderator at a presentation during the Green Roof and Wall Conference. He will preside over the session in which one of his students will speak: Allyssa Decker will present her thesis project, evaluating native plant species on the Student Success Center green roof. In addition, Paula Butts will give a poster presentation on vegetable production on the Morris University Center green roof. Both are graduate students majoring in environmental sciences. Green Roofs for Healthy Cities’ mission is to develop and protect the market by increasing the awareness of the economic, social and environmental benefits of green roofs, green walls and other forms of living architecture through education, advocacy, professional development and celebrations of excellence. Southern Illinois University Edwardsville provides students with a high quality, affordable education that prepares them for successful careers and lives of purpose. Built on the foundation of a broad-based liberal education, and enhanced by hands-on research and real-world experiences, the academic preparation SIUE students receive equips them to thrive in the global marketplace and make our communities better places to live. Situated on 2,660 acres of beautiful woodland atop the bluffs overlooking the natural beauty of the Mississippi River’s rich bottomland and only a short drive from downtown St. Louis, the SIUE campus is home to a diverse student body of more than 14,000.